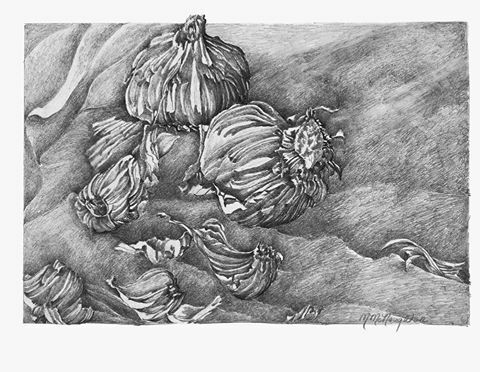 I am showing you a contour of a still life consisting of garlic. This tool does much of the work for you, It is revealing of form by demonstrating the light source, laying out your composition, and letting your personality pour out onto the page. This contour is part of a two drawing series that merely looks at a changing light source. Here are the gradations that were based on informative contour. We can begin to say more about our subject material when we examine ways to say something different about it. Here, we keep the placement of the still life the same and change the light source. I really like the strength of the cross-contour that you use, too often I think we settle for the outer contour alone, preventing the eye from moving around the form. 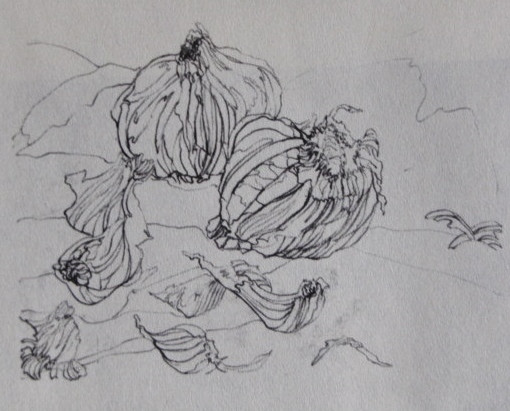 But I really enjoyed seeing the stem end of the garlic rise above the boundary and into the margin! You already know my “growth” issue with drawings – lol. I find that I also favor the light source coming from left in your examples – does that factor in to the artist’s ideas about expressing a particular “story”? Ha! Anita, you’re on to me concerning the left to right aspect of the light source! When I am showing students the power of using the contour, I start out saying,” And where is my light source coming from? and they always say, “from the left!” I am so helplessly right handed that I tend to see things from left to right more clearly. I love the idea that we can say things through serial imagery and begin to tell a story and the contour is such a facilitator of that. It can do so much of the work for us and be so descriptive of form! We talked about using the border to open up new relationships and ideas. I’d enjoy hearing more on that discussion! Take care!! Love our conversations!! 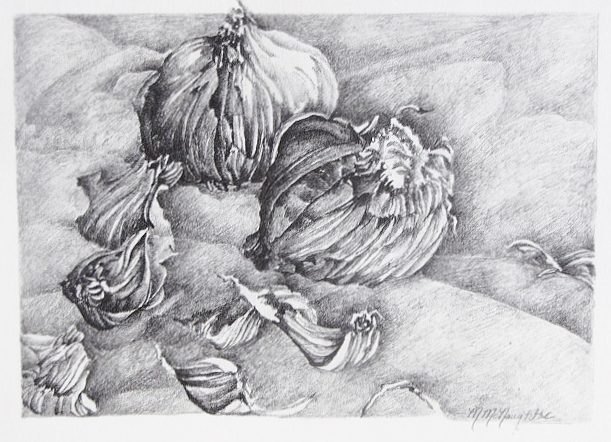 You are currently reading The Power of Telling our Stories at Dr. Mary McNaughton and Drawing.